Jack Baldwin is close to agreeing a new Posh contract. Peterborough United have offered injury-prone players Jermaine Anderson and Jack Baldwin ‘highly-incentivised’ new contracts which include a smaller basic salary. Both players have suffered serious knee ligament injuries during their Posh careers. They are both now entering the final year of their existing deals and will be placed on the transfer list if they don’t sign the fresh offer, in accordance with club policy. Posh midfielder Jermaine Anderson is miles away from agreeing a new contract at the ABAX Stadium. Posh director of football Barry Fry has revealed negotiations with Baldwin and Anderson have been ‘like chalk and cheese’. According to Fry Baldwin is close to accepting his revised terms, while Anderson is ‘miles away’ from an agreement. Posh chairman Darragh MacAnthony revealed Anderson had rejected the new contract offer last week. The 21 year-old midfielder was instantly criticised by fans on social media for his stance. Anderson has made just 27 Posh appearances in the last two seasons. He played just nine times last season and not at all since September 10, 2016. The former Arsenal youngster has undergone cruciate ligament operations on both knees. Posh chairman Darragh MacAnthony (left) and director of football Barry Fry want Jermaine Anderson and Jack Baldwin to sign new contracts. Fry said: “Jermaine and Jack have one year left on their contracts. Both have struggled with injuries and our new contract offers reflect that. “We want to keep them both which is why we have offered longer deals. We have offered two year contracts to replace their current deals on a lower wage, but with big financial incentives based on the games they play. “I would think having security for two years instead of one is a good thing. I accept there is a risk involved, but the club are also gambling on them both staying fit and performing well for us. “The difference between the negotiations is like chalk and cheese. Jack understands the situation and we are very close to agreeing his deal, but Jermaine and his agent don’t want to know. We are miles away from an agreement. “Jermaine needs to be careful. Having serious operations on both knees at this stage of his career is worrying. We believe in him as he’s a big, strong lad and a very good player, but no other club would be offering him a two-year contract right now. “We’re not even sure he will be ready to play until October and if he and Jack don’t agree to extend their stay they will be placed on the transfer list. 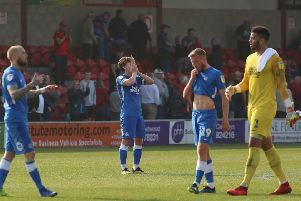 MacAnthony admitted surprise at Anderson’s refusual to re-sign, but Posh manager Grant McCann is confident Jermaine will see sense and commit to the club again. Anderson joined Posh as a 15 year-old and former boss Darren Ferguson handed him a first-team debut aged 16 in a Championship defeat at home to Blackburn. The 21 year-old has made 74 appearances for the club, scoring eight goals. Baldwin moved to Posh for a reported £500k from Hartlepool in January 2014. He’s made 75 appearances for the club scoring twice. Anderson didn’t respond to a Peterborough Telegraph request for comment.